Sandro Botticelli (1445 - 1521) is, beyond a doubt, one of the most beloved artists of the Uffizi Gallery. His Birth of Venus and Primavera are the Uffizi symbols, known throughout the world. However, in the Florentine museum other works by the master are housed. These paintings are less famous, but they occupy an important place in art history, they are among the masterpieces of Italian painting. The new setup of the Botticelli room also aims to allow visitors to observe them carefully. 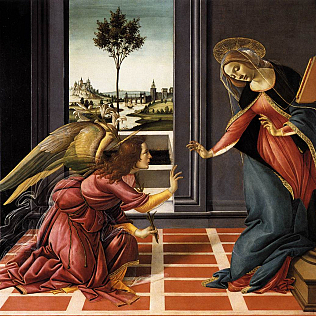 The Cestello Annunciation is one of these works. The tempera on panel painting was made in 1489-90 for the Guardi family chapel in the monastery church of Cestello in Pinti. The painting has been at the Uffizi since 1872. In 1986 it was restored. The work represents the moment in which the angel arrives to the Virgin Mary. We notice this from its veil, yet relieved. Mary was reading, but she turns to the man. The two exchange deep looks. The angel holds out to the young woman a white lily, that is the symbol of her purity. The two figures are represented dynamically, both pictured while they are moving. The scene takes place in an interior, which opens onto a landscape heavily inspired by Flemish painting of that period. There is a river and two castles, connected by a bridge. Botticelli painted this work in a period during which the influence of Girolamo Savonarola (1452 - 1498) was strong on him. We notice it especially from the drama that emerges from the two protagonists of the painting.